Forget the Prince Harry pics – was I right to publish that Nick Clegg poll? 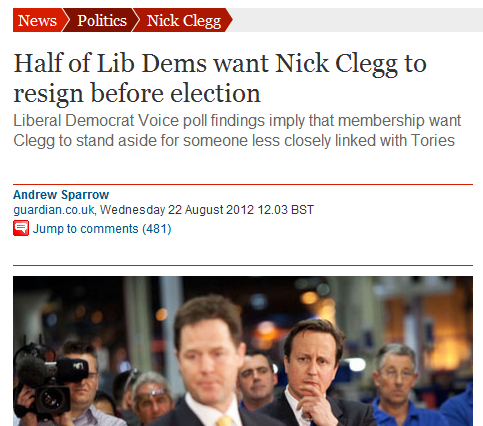 My report this morning on LibDemVoice of our latest survey of party members showing that we’re split 47%-46% on whether Nick Clegg should fight 2015 election as party leader has been picked up by Andrew Sparrow in The Guardian today under the more emphatic headline ‘Half of Lib Dems want Nick Clegg to resign before election’. It’s always a bit of a dilemma when I set up these polls what questions to ask, the more so if I’m aware any negative results they throw up could be seized on by the media. I endeavour to steer a middle course (I’m such a cliche sometimes), trying not to dodge asking questions I think members will have views on, equally trying not to sensationalise the outcomes. I think my analysis of today’s results saw me cling on to that tight-rope. For a poll on such an important topic, don’t you think it would have been a better idea to poll all paid-up party members? So you then gained views from across the party, rather than just your coterie of 500 people generating national negative coverage? Better still, of course, would have been that you scrap your ill-considered and self-indulgent poll entirely. The Lib Dems really don’t need enemies when they have friends like you lot. The LibDemVoice forum is open to any and all paid-up party members to join. Some 1,200 have done so. Naturally we can only survey those who’ve signed up. Equally naturally the party itself is unlikely to ask this kind of survey question of all members. You say the survey is ill-considered — do you mean that we shouldn’t have asked the question at all? In which case I disagree. Nick Clegg’s leadership is an issue members are discussing and have views on, as shown by the responses to the survey. Will those views disappear simply because we don’t ask the question? I don’t think so. As for the negative media coverage – one article in the Guardian unless I’ve missed anything else – I’d be staggered if it shifted a single vote. Of course you were. Freedom of information, trust in the wisdom of the people (i.e. party members), not shying away from bad news. Not publishing would have been just wrong.